An overactive third eye chakra can be disorienting and cause of much psychological and psychic distress. When this energy center is on overdrive, you may feel like you are getting lost in an endless stream of phantasmagoric visions or being bombarded by nonsensical pieces of information. Having an overactive third eye might sweep you off your feet if you are not grounded enough. A common sign of hyperactivity in the third eye chakra is overindulging in a fantasy world while losing touch with reality. Another symptomatic manifestation is being overly concerned or fearful about the phantasmagorical visions passing before your mind’s eye. These are common symptoms when the third eye is opening without having enough overall balance and support from the lower chakras. When the Third Eye is balanced you see everything clearly. You function and make decisions with a sense of neutrality; meaning you are concerned, but not attached, to any single outcome. Highly focused, you can make the distinction between reality and dreams (or imagination). 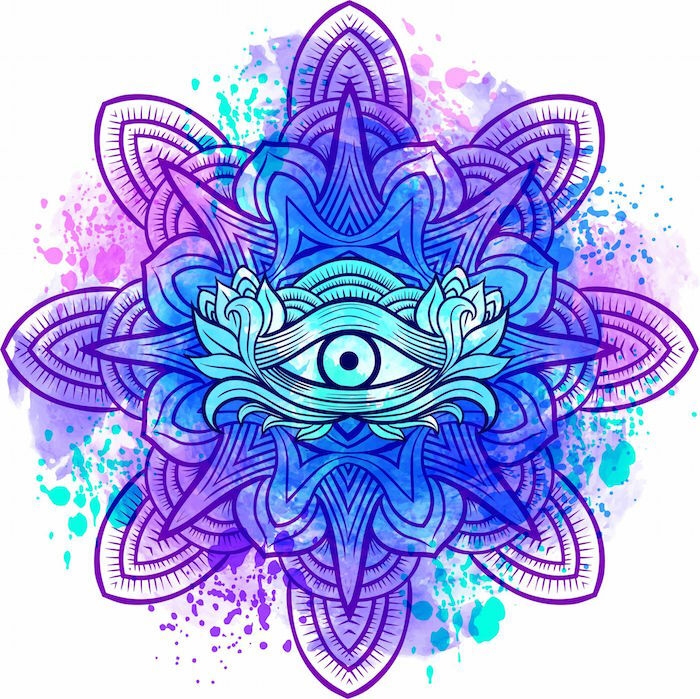 When the third eye is in overdrive, so to speak, the constant flow of thoughts can be mentally exhausting.You may feel intimidated by having to make decisions that would normally be quite simple. That indecisiveness is oftentimes influenced by clouded judgement, lack of focus, and an inability to distinguish what is real — all signs your sixth chakra needs to be balanced. If you feel the visions are too much for you to handle or the pieces of information are coming too fast, you can always ask for them to slow down. You might also thank the source of guidance you feel is involved then, and humbly say that you need a bit more time to be fully available to receive all the information. If you feel the visions and energies you experience are going out of control, firmly anchor yourself in your body and root yourself into the Earth as much as possible. You can also ask for protection and guidance to make your experience more comfortable. Ask to receive information in a way you can process or understand more easily. More than just the third eye chakra being over-activated, the issue may arise from a lack of overall balance in your energy system. The ability to apply discernment towards the information you receive through this energy center. You can use other chakras and their qualities, such as the second (sacral) or fourth chakra (heart). For example, the second chakra can help filter your intuitive hits and anchor them in your emotional and physical field. The heart chakra might bring a balanced and compassionate perspective to navigate through what may otherwise appear disincarnate or threatening. Of course, working on strengthening the energy of your root chakra is key is keeping your grounds while allowing the qualities of the third eye chakra to develop more fully. For instance, it’s important to ground yourself while opening up the third eye chakra. Without being properly grounded, your visions might sweep you off your feet. Far from being contradictory, the influence of the root chakra energy supports the activity of the third eye chakra. An important point to remember when opening your third eye! To restore balance to the sixth chakra, incorporate subtle, positive lifestyle changes, such as introducing healthy, whole foods into your diet, and getting regular exercise. Energy healing, such as Reiki, aromatherapy, crystals, and sound therapy, can also help to restore chakra balance. These are high vibrational practices are particularly suitable to balance the third eye chakra. Make sure you focus on the intention of soothing and balancing this energy center. If the imbalance is significantly impacting your life, visiting a trusted energy healer may be something to consider. The third eye chakra is recognized as being represented by the color indigo, which is a combination of colors deepest blue and violet. Their combination is associated with wisdom and devotion. Both characteristics play an important role in the development of the sixth chakra.